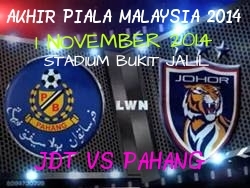 The epic match final between johor darul takzim vs pahang will meet at stadium bukit jalil this saturday 1 november 2014. This is because, the second yellow card accumulate previous match semi final match first leg vs felda united, aidil zafuan get yellow card. And for the semi final also get yellow card because the sliding tackle to junior wilson. Also the striker, nazwin nanawi get red card before the wistle time up because of the fighting unprofesional both two teams like a children. All the best both of this team on saturday 1 november 2014 piala malaysia.